If you are planning a wedding this summer, chances are, your wedding is not the only one your guests will be attending this season. Your guests are probably very happy to celebrate with you; however, remember that it also costs them money to attend your wedding along with others they may be invited to. It is always a good idea to “thank them” with small touches to increase their comfort by allowing them to be involved in your day and/or providing them with a memento that they will be able to use. Ask your guests their opinions. When you send out your RSVP cards, ask your guests to write down their favorite song or favorite drink. This will provide you with broader options/choices and will also help them to feel involved in your big day! A welcome bag for out of town guests. These bags can be as small or involved as you want them to be. Usually included in these bags are snacks, maps of the area, ideas for local restaurants or attractions and possibly some coupons if you have connections! Provide a basket of handkerchiefs or tissues for your guests during your vows. As much as anyone denies it, watching a wedding for someone you care about can bring on the waterworks! Leave small notes at each person’s table setting (if you are doing assigned seating) – this adds a small intimate touch during a time when you may not be able to talk or spend time with everyone attending your ceremony. Multi-purpose wedding programs. These can double as a fan for outdoor weddings during hot seasons or they can even be printed on bags that also serve to hold the confetti as the couple leave for their honeymoon. Personalized drink glasses. These are becoming a hit lately, especially for shabby chic weddings. You can also double these as their gift for attending your wedding/ceremony. Dancing shoes. I cannot tell you how many women pull off their high heels in order to be able to dance at weddings. 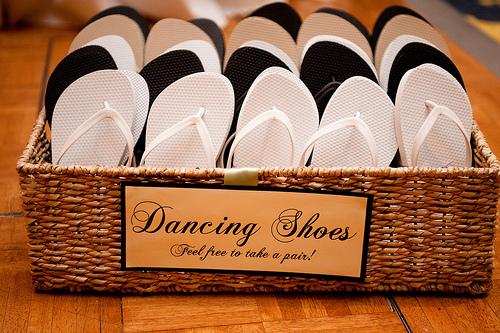 Providing a basket of flip flops allows your guests to “cover” their feet while providing comfort for dancing! These can also be a gift for your guests. Provide options to guests. Finally, when people are celebrating; sometimes guests can pass a point where they are not able to drive or make good decisions. Investigate the area before your wedding/celebration and have numbers of taxis, hotels, shuttles, or even designated drivers available to make sure everyone is safe and taken care of. Many event facilities offer packages for area hotels, shuttle services and other options for these issues. Gala Event Facility has a seasoned manager on staff, Kathi Bland, who has seen many “tricks of the trade”. 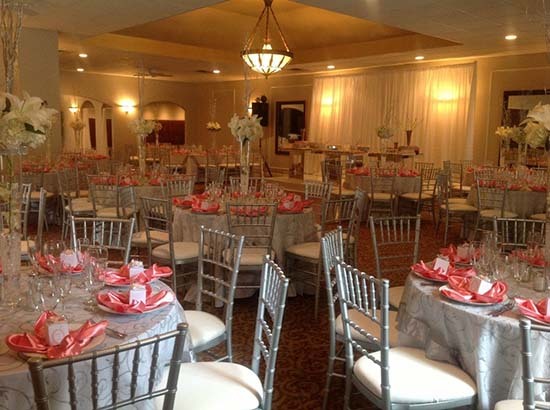 She can help you to organize your wedding/event to allow for an worry-free day for your event, assist you in decorating our facility to your specification/theme, and help you in adding just the right touches for your guests! Please check out our web site and read our reviews: www.galafacility.com or “like” our Facebook page and follow our posting and customer comments. We also have a Pinterest account and we update our pages often to include the most current trends.